After “Trust on Tri­al”, I asked for a game kit for SCRAP’s “Zero Escape Puz­zle Hunt”. This was SCRAP LA’s first “Escape Park” style game, where you go around the neigh­bor­hood find­ing clues to solve the puz­zles on your game kit. It played dur­ing Ani­mé Expo at the con­ven­tion hall and around Lit­tle Tokyo. For peo­ple with­out Ani­mé Expo badges, there is a “cheat sheet” post­card with copies of the clues in the hall. It is very sim­i­lar to SCRAP SF’s “10,000 Trea­sure Hunters” games, which were coor­di­nat­ed with Japantown’s JPOP Fes­ti­val. The game is free to play; I think 10,000 Trea­sure Hunters was a very cheap tick­et just for crowd con­trol pur­pos­es. And both were of low­er dif­fi­cul­ty than stan­dard SCRAP games. The over­all puz­zle hunt was very short. There were four puz­zle clues inside Ani­mé Expo, which I got from the post­card. There are three remain­ing clues out­side. One was post­ed in the win­dow of SCRAP LA’s store­front, and the final two used sig­nage from busi­ness­es in the area. Using edu­cat­ed guess­es, I did not need to vis­it the two busi­ness­es, so the only clue from the entire puz­zle hunt that I need­ed to vis­it in per­son was the one at SCRAP LA. Even with the oblig­a­tory SCRAP twist for the last puz­zle, the entire game took me about 15 min­utes to com­plete on my own. Slight­ly dis­ap­point­ed, I made my way over to the end loca­tion. Instead of staff check­ing your phys­i­cal answer sheet at check­points, Zero Escape Puz­zle Hunt used a web­site check-in sys­tem. After you solved the final puz­zle, it asks you to post your suc­cess to social media. The end loca­tion staffers just check for your post before giv­ing you a prize. 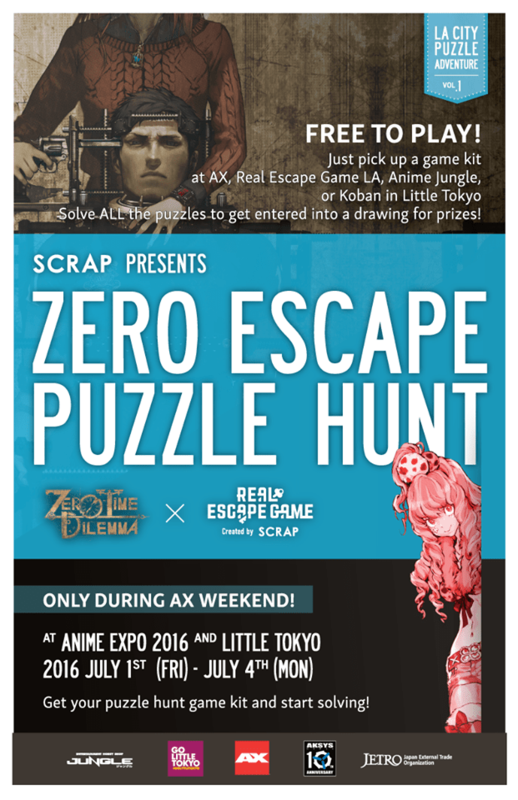 I got lucky num­ber 5 from the prize wheel — a post­card ad for Zero Escape — Zero Time Dilem­ma and a dis­count code for a future SCRAP game. Com­ing from an escape room stand­point, this was not SCRAP’s best work, but I am sure peo­ple who came for Ani­mé Expo and got this as a treat enjoyed it. Espe­cial­ly the ladies, who were unan­i­mous fans of the Jun­pei cutout. 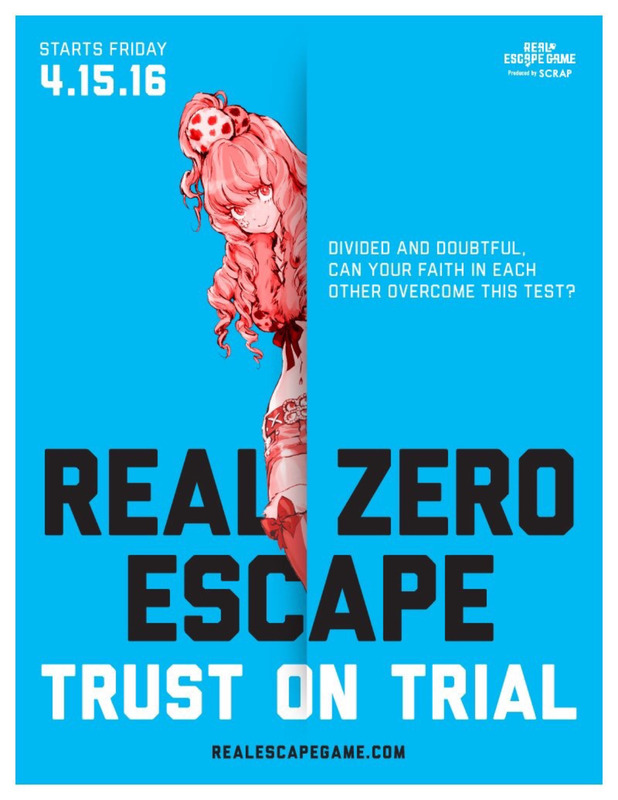 SCRAP announced “Real Zero Escape — Trust on Tri­al” even before I moved down to LA. I imme­di­ate­ly tried to orga­nize some of my usu­al escape game group to make a road trip with me to play it. How­ev­er, this game requires a team of nine play­ers, and I moved down here and it fell apart. 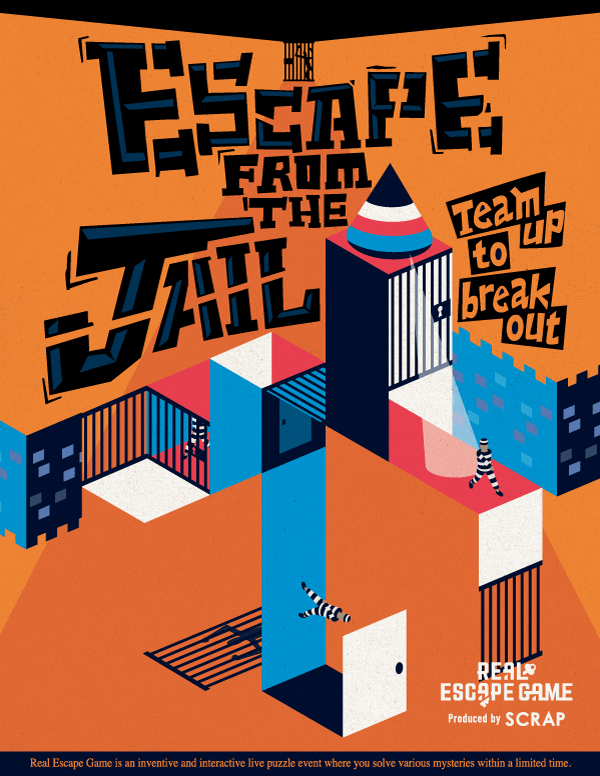 When we played “Escape from the Jail”, the staff said they could only guar­an­tee it would be around until the end of June, but might be avail­able longer if there was sus­tained demand. About halfway through June, when I real­ized that I was not going to be able to get a group down in time to play, I signed up to play on my own. It was the first time I played with­out know­ing any of my team­mates. The week­end I signed up, July 1-July 4, was when Ani­mé Expo was in town, so there was much more activ­i­ty than usu­al in Lit­tle Tokyo. 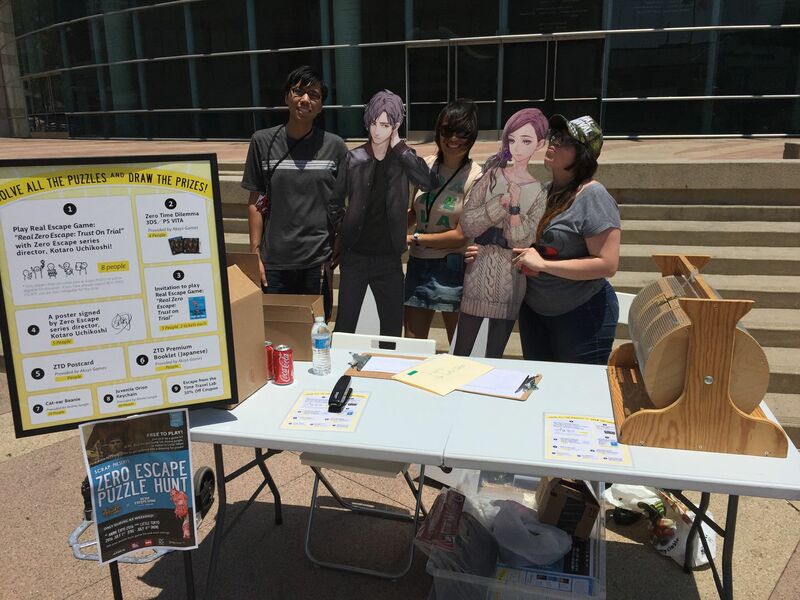 In fact, SCRAP was run­ning an out­door event over the con­ven­tion week­end called “Zero Escape Puz­zle Hunt”. My team were all out-of-town­ers here for the con­ven­tion, and while they were very famil­iar with Zero Escape, the video game the­me this par­tic­u­lar room was based on, (some of them were cos­play­ing as char­ac­ters from the game) they did not have much escape room expe­ri­ence. I, on the oth­er hand, knew noth­ing about Zero Escape going into this game. The game itself was like refined iter­a­tion of “Escape from the Jail”. The intro brief­ing is by video from a char­ac­ter from the game. The team is split into three small­er teams and placed into three sep­a­rate rooms. Com­mu­ni­ca­tion is much more dif­fi­cult between the small­er teams than it was in “Escape from the Jail”, and you are more depen­dent on the oth­er teams to solve the puz­zles in your own room. This game had the biggest use of tech­nol­o­gy in the puz­zles that I have seen from SCRAP. In true SCRAP fash­ion, when your small­er team solves the indi­vid­u­al room puz­zles and gets back into the main room, all the pieces of pre­vi­ous puz­zles are mixed up and reused for the next por­tion. One minor com­plaint I had about this stage is that the final lock in each small­er room has the same com­bi­na­tion, so we could have just given the answer to any oth­er team that was lag­ging behind on get­ting back to the main room. The final puz­zle is a very cool syn­chro­nized event that is very nerve-rack­ing as you try to pull it off. The title of the game, “Trust on Tri­al”, and the intro brief­ing implied that trust is key to solv­ing the game. I thought that meant there would be a trai­tor in our mid­st, but I was not sure how that would work since the team could nine strangers or nine best friends. Would peo­ple set aside their real rela­tion­ships to play a trai­tor in the game? SCRAP could not count on that, so it had to be some­thing bet­ter. There is one point in the game where we get access to our char­ac­ters’ jour­nals and need to cross-ref­er­ence the state­ments like a zebra puz­zle in order to solve the next puz­zle. I thought that may­be one char­ac­ter would be a liar and we had to ignore or invert their state­ments to solve the puz­zle. The answer is a bit sim­pler than that. The nine of us are in deed work­ing as a sin­gle team. We just have to “trust” that our team­mates in the oth­er rooms are good enough to solve their puz­zles and help us solve our own puz­zles. All in all, a very slick SCRAP game. Mechan­ics-wise, pos­si­bly the best SCRAP game I have played. Puz­zle-wise, fair­ly stan­dard SCRAP dif­fi­cul­ty, but the com­mu­ni­ca­tion lim­i­ta­tion makes it more chal­leng­ing. I def­i­nite­ly rec­om­mend the game, but only if your team is fair­ly expe­ri­enced in escape rooms. My team, of course, failed on the final puz­zle. Oh, and I saw Suta and Kazu there. I believe Yuki was work­ing the con­ven­tion, but I did not run into her. Also got to meet the very friend­ly SCRAP LA staff, who I am sure will soon be sick of me. Suta is a big Zero Escape fan and helped devel­op this game, so while we were doing the debrief, she also point­ed out all the East­er eggs she had hid­den for fans. I went back to San Fran­cis­co in April to play SCRAP’s lat­est escape room, Escape from the Jail, with my usu­al crew plus a few new peo­ple. “Escape Room” — Your team is any­where from four to twelve play­ers. The team books exclu­sive access to a room for a speci­fic time slot. You tear it apart look­ing for clues to solve puz­zles and “win” by find­ing the key to phys­i­cal­ly get your­selves out of the room. “Escape Game” — Your team is always six play­ers. The team gets one table in a large con­fer­ence room, with any­where from twen­ty to thir­ty oth­er teams also play­ing at the same time. Each team gets a dupli­cate copy of the puz­zles and simul­ta­ne­ous­ly tries to solve them. Tech­ni­cal­ly every team can “win” by putting down the cor­rect “final answer” on your answer sheet. “Escape Park” — Your team can be any num­ber of play­ers. The team runs around a large open area such as a city neigh­bor­hood or sports sta­di­um. Each team gets a dupli­cate copy of the puz­zles and simul­ta­ne­ous­ly tries to solve them. Tech­ni­cal­ly every team can “win” by putting down the cor­rect “final answer” on your answer sheet. (My names, not theirs.) The­se dif­fer­ent for­mats allow SCRAP to put unique twists on their games as well as roll out new games much more often than com­pet­ing com­pa­nies that only do “tra­di­tion­al” escape rooms. SCRAP’s most recent offer­ing was Escape from the Jail, which is in the “escape room” for­mat. The game is still cur­rent­ly run­ning, so I do not want to give away too much. Obvi­ous­ly, the the­me is a pris­on set­ting. The sto­ry is that we were false­ly accused of a crime and have to escape before we are exe­cut­ed. SCRAP’s observers were described to us as ghosts of past pris­on­ers; I appre­ci­ate that they always have an expla­na­tion of why staff is in the room with you. Besides the usu­al safe­ty rules (no run­ning, do not touch things marked as not part of the game, etc. ), there were a cou­ple of new wrin­kles. First, our team was split in two, and locked into adjoin­ing cells with a solid wall in between. One staff mem­ber role-played a pris­on guard rather than just a silent observer. He enforced the pris­on-speci­fic rules, includ­ing no talk­ing between cells! 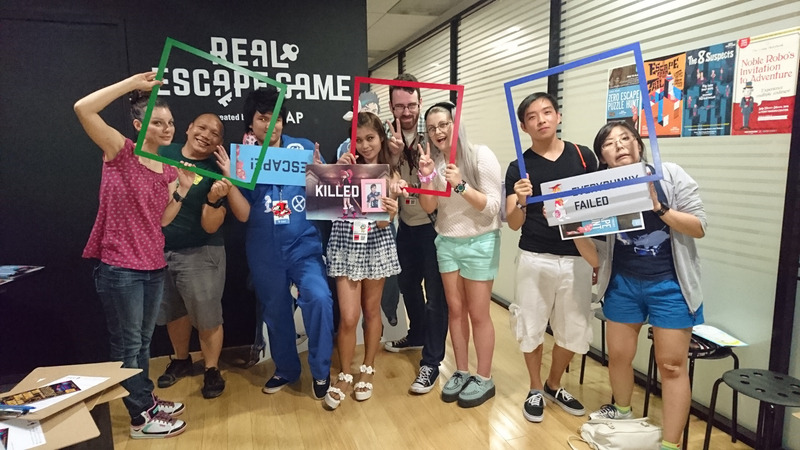 If you have played any escape games before, you know how vital com­mu­ni­ca­tion with team mem­bers is, so this lim­i­ta­tion made the game very inter­est­ing. The puz­zle for­mat was very sim­i­lar to pre­vi­ous SCRAP games — you solve small­er puz­zles through­out the room and they feed into a “mas­ter puz­zle” cross­word that you have to ref­er­ence over and over. As usu­al, the puz­zles are well designed and fair­ly dif­fi­cult, but can be solved pure­ly through skill and with­out need of out­side knowl­edge. It is hard to hold this again­st SCRAP, since it is not real­ly their style to have any phys­i­cal chal­lenges, thought I would like to see more of this type of thing from their escape room sce­nar­ios. I think the most dif­fi­cult thing we had to do was use hand tools to take apart a locked box. My group of escape artists knows most of the SCRAP staff by name, but they have been hir­ing more and more late­ly. The staffers are this par­tic­u­lar game were all new to us, but they were well trained, and the guard was out­stand­ing. SCRAP games are always fun to me because their puz­zle design is great brinks­man­ship — we are always around the final puz­zle when time is up! The oth­er impor­tant fac­tor to me is involve­ment — there needs to be enough mate­ri­al for every team mem­ber to be work­ing on some­thing at a given time. SCRAP usu­al­ly nails this because of their ten­den­cy to reuse puz­zle pieces. Even if there are not enough new puz­zles for mem­bers to work on, some­one can and should be review­ing pre­vi­ous puz­zles to see if they can be applied. Over­all, it was a great game. And true to team tra­di­tion, we failed with final key in hand, rac­ing for the exit door!